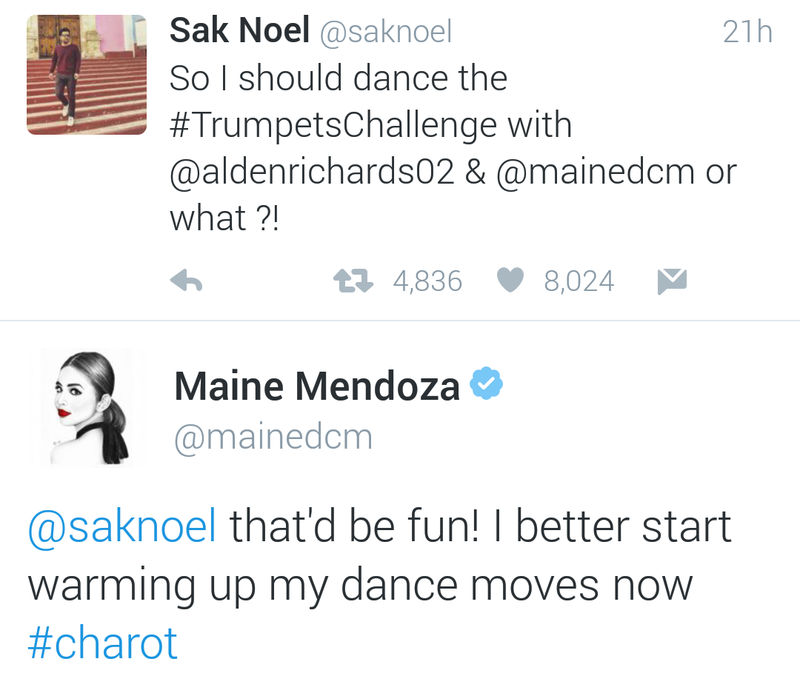 Fans of Vice Ganda and ALDUB are warring over the 'Trumpets' dance craze as to who should get the credit for making it so popular in the Philippines. 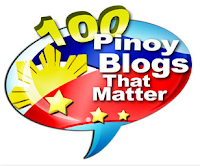 Said single is now #1 on iTunes Philippines. 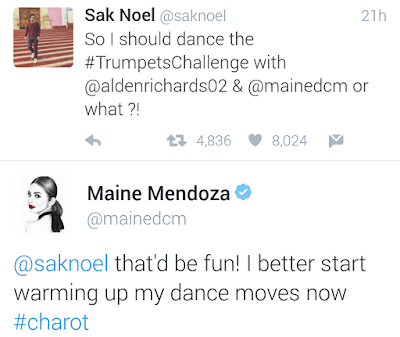 Actually, it's just another reason to further intensify TV rivalry between noontime shows 'It's Showtime' and 'Eat Bulaga'. Showtimers are claiming they're the first to play 'Trumpets' here in the country, while the DaBarkads believe Alden Richards is the reason why it's immensely popular now. 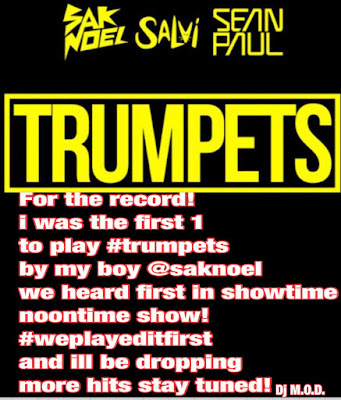 'Trumpets' is a dance track from Spanish DJ and music producer Sak Noel & Salvi with featured Jamaican artist Sean Paul. 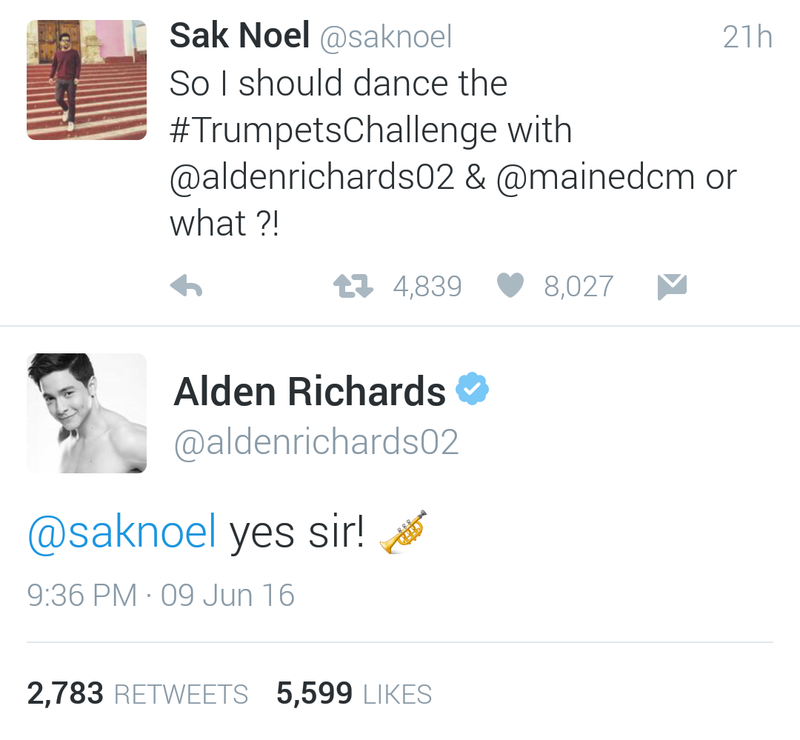 I actually first saw Vice Ganda dancing to it last May 5 during Tawag ng Tanghalan segment on It's Showtime, and he's been dancing to it since then, while Eat Bulaga has started the Trumpets Challenge just recently, with Alden Richards doing it only 3 days ago. 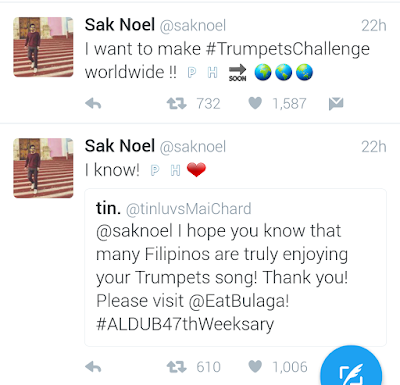 Now a Twitter war has started between their fans when Sak Noel tweeted about his desire to do the Trumpets challenge with ALDUB Alden and Maiden, after some of their fans apparently have been tagging him on Twitter, requesting him to come to the Philippines to do it. As you can see, both Alden and Maiden replied to his tweet. 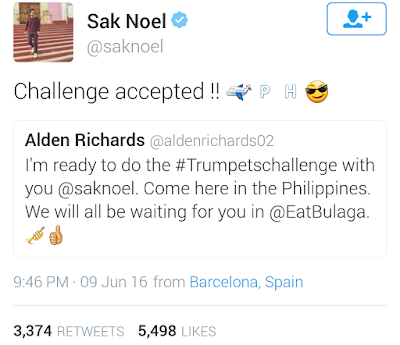 Then Alden tweeted again after 10 minutes, telling Sak Noel that he's interested to do the Trumpets Challenge with him, inviting him to come to the Philippines. 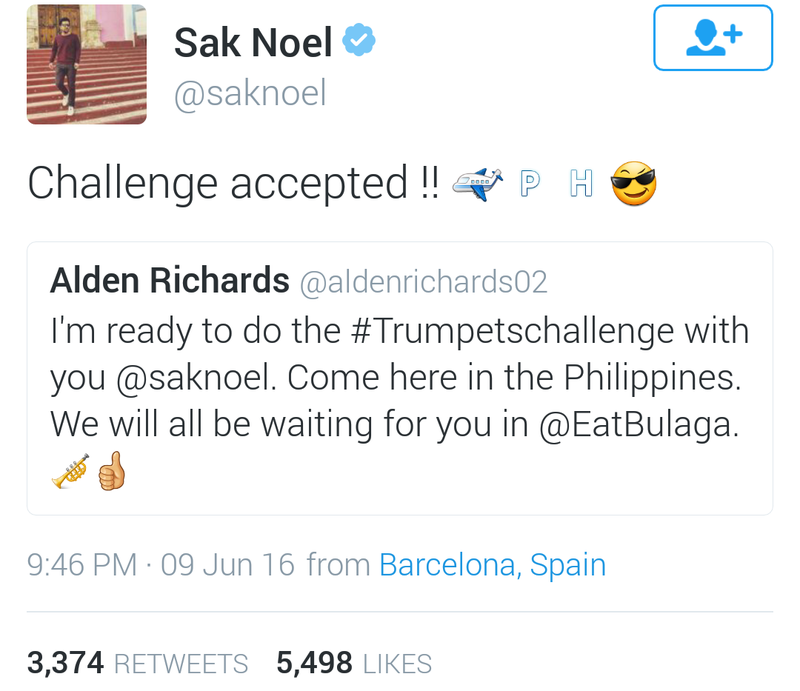 Sak Noel accepted the challenge and he is expected to make an "appearance" today on Eat Bulaga. 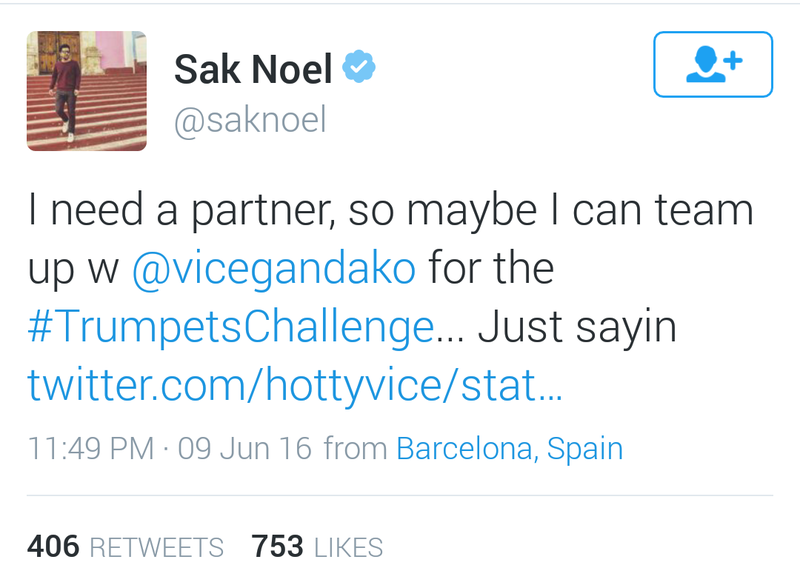 Perhaps after realizing that he made an honest mistake of not crediting Vice Ganda first for its success here in the Philippines, Sak Noel later posted that he wants to team up with Vice for the challenge today on Eat Bulaga, which is obviously not possible since Vice is from the rival show. One fan tweeted his disappointed on Sak Noel not giving proper credit to Vice. 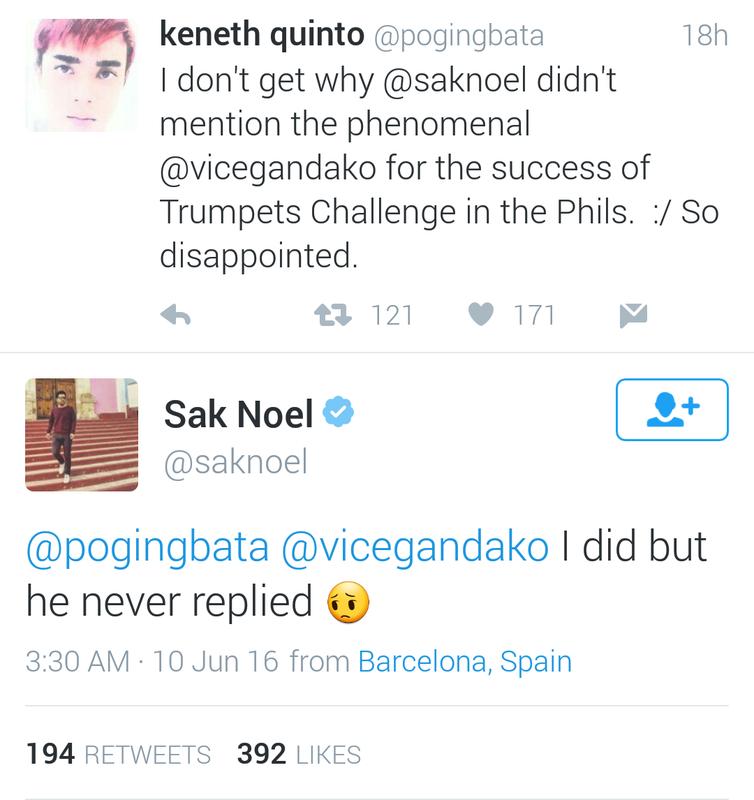 He replied, telling the fan that he did but Vice never replied. 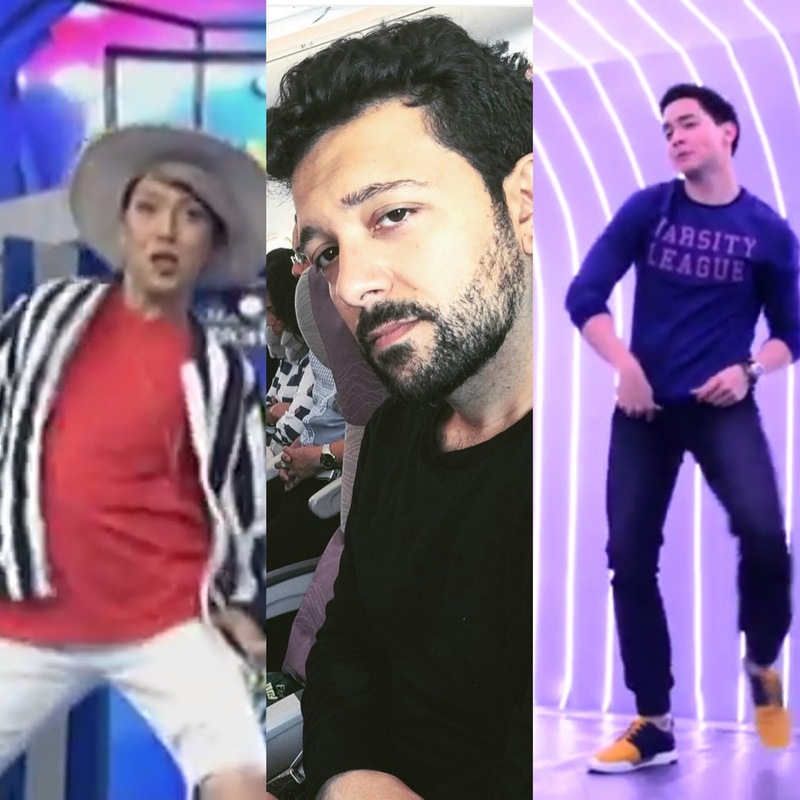 Vice has been silent about it, but Showtime's resident DJ has released this photo, telling everyone that he's the one who played it first in the Philippines. Yesterday on Showtime, I also heard DJ MOD screaming "You heard it first, we played it first on Showtime" while Vice, the Hashtags and other hosts were dancing to "Trumpets" during their opening prod.